I have to admit, I sort of admire this person’s determination and willingness to help his friends. These are admirable qualities, it’s just that they maybe didn’t execute their plans in the best way. At least, that’s what the Valley Division CHP felt, when they arrested this person who appears to have been driving a rental box truck towing an SUV, which was, in turn, towing a camping trailer. That’s a train, buddy. The three-car road-train was stopped on I-80 near Penryn, California, where it was driving at 30 MPH, and causing traffic issues on the highway. The driver of the rig was purportedly rescuing their friend in the black SUV, which broke down while towing the camper in Nevada. The friend allegedly rented a truck and trailer, and loaded the SUV on the trailer, still towing the camper. CHP also stated that the SUV was only secured to the tow dolly via “straps on the front tires,” I suppose suggesting that the safety chains were not used. 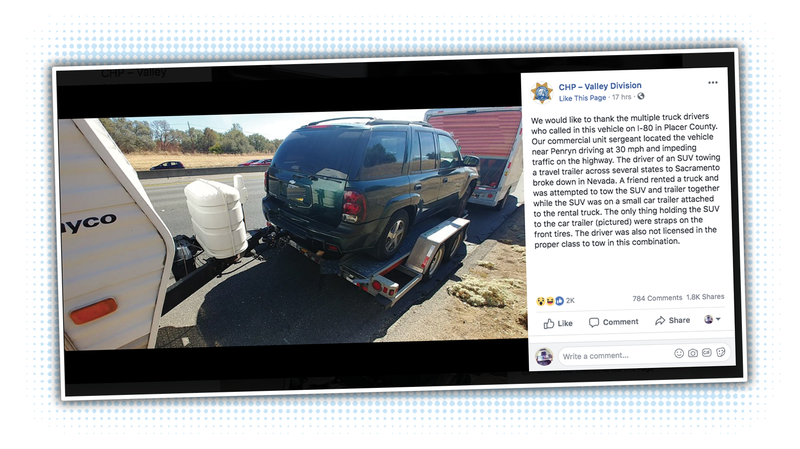 The CHP also stated in their Facebook post that “the driver was also not licensed in the proper class to tow in this combination,” which sort of implies there is a legal way to tow in this combination, which I sort of doubt. Anyway, kudos for being a good friend, but maybe next time tow the camper and the SUV separately. 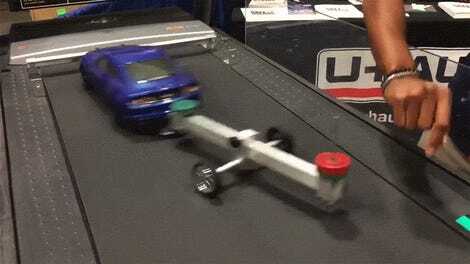 What&apos;s The Most Surprisingly Effective Towing Vehicle?